Nebraska’s season came to an end on Saturday afternoon thanks to a poor rebounding effort and ice-cold shooting in the third quarter as the No. 10 Huskers fell to No. 7 Arizona State 73-62. “We were very excited to be a part of the field, and disappointed that we weren't able to play a little bit better in this first-round game,” Coach Amy Williams said. “We knew though it was going to take a very special rebounding effort on our part, and we just didn't take care of that. We got out-rebounded by 22 rebounds you're not going to win very many games, particularly not in the NCAA Tournament if you can't handle that area of the game." The Sun Devils dominated the Huskers on the glass, out-rebounding them 49-27 including 21-8 on the offensive end. Neither team shot well from the field (Huskers 37.3 percent, Sun Devils 38.3 percent) and Nebraska knocked down twice as many 3-pointers (eight to four), but Arizona State was plus-seven from the free-throw line and plus-10 in second-chance points. Senior Janay Morton led the Huskers with 16 points and four rebounds and freshman Taylor Kissinger added 15 points and four rebounds as the Nebraska bench outscored its starting lineup 35-27. Sophomore Hannah Whitish had 12 points. Nebraska’s second-leading scorer and rebounder, Maddie Simon, finished with a zero in both categories after playing just 15 minutes while dealing with foul trouble all game. “I really felt like Maddie was going to be a key for today's game,” Williams said. “We really felt like that. We challenged Maddie. We talked to her yesterday in practice, today at shoot-around we said we need you to strive to come away with 10 rebounds in this ballgame. Unfortunately, Maddie was saddled with foul trouble the whole game, and not only did she not come away with ten, but she had the goose egg in the rebounding category. Omaha Benson alumna Kiana Ibis was one of four Sun Devils in double figures with 14 points and eight rebounds. The first half included six ties and seven lead changes as neither team managed to create any separation. However, Arizona State did hold a narrow lead for much of the first 20 minutes on the strength of its rebounding as the Sun Devils held an 11-2 edge on offensive boards and a 9-2 advantage on second chance points. Janay Morton checked in off the Nebraska bench and poured in 12 points, including eight in the second quarter, to lead all scorers in the first half. Nebraska only got eight points from its starting lineup in the first half. The teams battled to a 13-13 tie at the end of the first and a 27-27 tie heading into halftime. Hannah Whitish got going a bit in the third quarter, hitting pull-up 3s on back-to-back possessions to put the Huskers up 36-33. Arizona State hit a pair of free throws to pull within one but Taylor Kissinger answered with a driving layup with 5:33 to play. That layup proved to be Nebraska’s last field goal until Kissinger hit a 3 midway through the fourth quarter. Arizona State ripped off a 16-1 run to take a 51-39 lead. Jasmine Cincore drew a foul with less than a second on the clock and split the free throws to get one point back heading into the fourth. The Huskers missed their last seven shots after hitting four of their first five. Nebraska’ field-goal drought continued into the fourth quarter as the Sun Devils scored the first five pints to stretch their lead to 16 at 56-40, but Kissinger countered with five straight including a pair of free throws and a 3 that snapped a drought spanning nearly eight-and-a-half minutes. Nebraska got no closer than nine the rest of the way as Arizona State held on to advance to the second round. 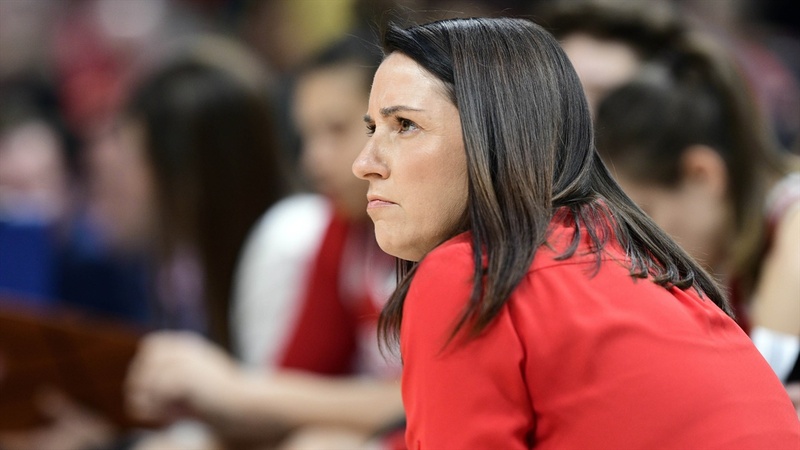 Nebraska wraps up its season at 21-11 just a year after going 7-22 in Amy Williams’ first season in Lincoln. The Huskers will lose three seniors — Morton, Cincore and Emily Wood — but return their top five scorers, four of whom were sophomores or freshmen this year.